I hope everyone is having a great Friday so far. I definitely started it off right! We got our morning walk in before the air was completely unbearable. It is so hot here! I think we may actually be heading to the illustrator's parents house for the weekend! It will be the last chance we get for a while and since they live on the lake, it will be a nice refreshing get away for a day. After the bigger lunch yesterday, I was craving something light for dinner. I bought peaches the other day on sale and since I had not enjoyed any summer peaches yet, I thought this would be the perfect opportunity. I also had some mung bean sprouts that were ready to be enjoyed! 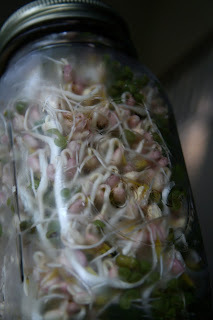 Have you ever grown your own bean sprouts? They are so easy to do! We actually started our sprouting adventures last summer and became addicted to them. They are so great on summer salads and in veggie stir fries! Besides being tasty these suckers are really nutritious! Bean sprouts are pretty fascinating. Mung bean sprouts are high in vitamins A, B, C, and E, calcium, iron, magnesium, potassium, and amino acids. They are also a good source of protein and fiber. Another comforting thing, when you grow them at home, you don't have to worry about food born illnesses! Did I mention how much cheaper they are too? 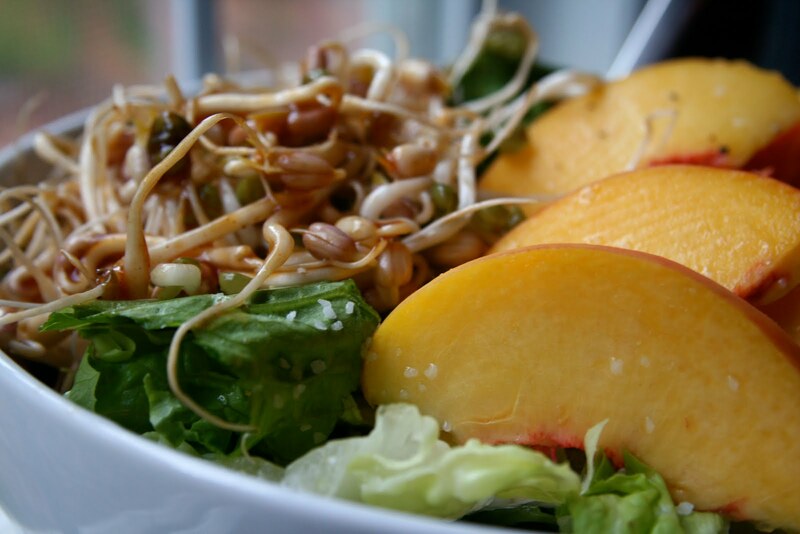 I decided to add a little BBQ sauce to some bean sprouts for a raw BBQ salad with fresh Georgia peaches! Perfect summer salad! Soak beans 8 hours in a jar with purified water. Place a mesh on top of the jar (or a lid with holes poked in the top) and drain the water off the beans. Store in a place outside of direct sun light. Rinse and drain 3 times a day for 3 days or until they are the size you want. Then refrigerate and enjoy! I have also grown lentil sprouts and I love them too! Do you like sprouts? Have you ever grown them before? I've never sprouted anything (not on purpose anyway). I hope you have a super relaxing time. I know you need and deserve it. I like sprouts but have certainly never grown them before. I wouldn't even know where to begin. Hope you guys have a wonderful weekend at the lake! I love sprouts but have never grown my own. You make it look so easy too! I've never tried sprouts before. I should try this! I love sprouts, but I've never grown my own! 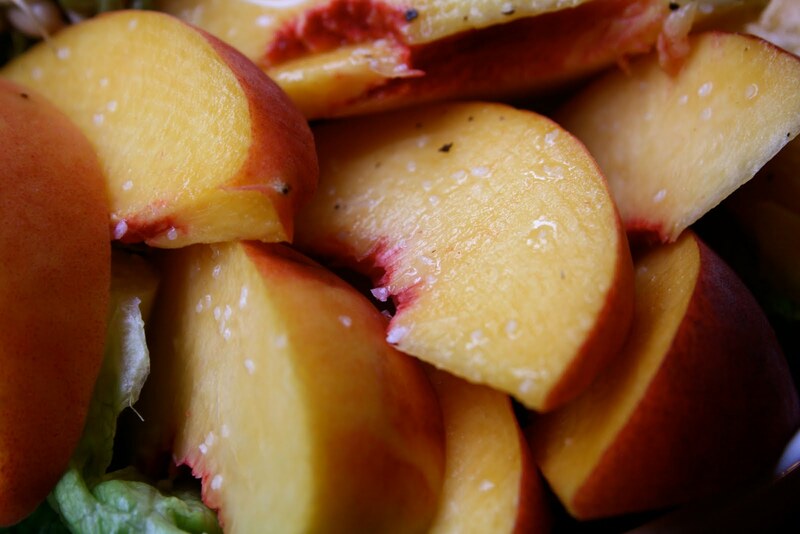 Mmm peaches are the best summer fruit aren't they?! And I would love to grow my own sprouts. I wish I had more of a green thumb! This is another one of a kind dish. I have never seen anything like that. I think vegetarian will going to love that dish. It is healthy and the ingredients are so fresh. Oooh I want to try to grow sprouts! That sounds so exciting! I bet the BBQ + Peach combo was great! I haven't ever sprouted, but I did try once. It was such a big fail I never tried again. I really should this summer though while I have the time. Sprouts look great. We do not sprout that much, just never really got into. There are things I enjoy I guess. We are having a Sprouting class at Rollin' Oats (the store where I work) in September. I am so excited! I like alfalfa sprouts! I wonder uf I'd like mung beans! Have I Mentioned How Much I Love Waffles? Giant Caramel Cinnamon Roll and a happy mess!